This excerpt is from “The Twig,” our donor newsletter. Click the cover to view the full issue. For years people have been asking us whether they can visit Trevlac Bluffs Nature Preserve. It’s easy to see why: the steep bluff protects a rare stand of eastern hemlock trees and beautiful Beanblossom Creek flows through the Preserve. However, there was no safe access to the Preserve or a trail to reach the bluff. 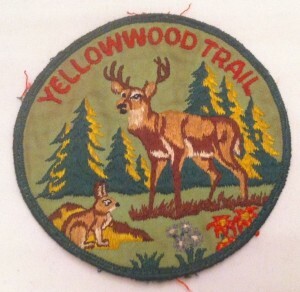 Patches designed by ken Tuxhorn were available to hikers to commemorate their hike along the Yellowwood Trail. 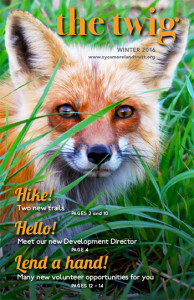 Now, thanks to a grant from Brown County Community Foundation and help from Sycamore’s volunteers, you can explore Trevlac Bluffs Nature Preserve via two trails. The first is the historic Yellowwood Trail created by Ken Tuxhorn in 1949. It was an 11-mile trail ending at Bear Wallow, where hikers could camp. The trailhead was near the intersection of Old SR 45 and new SR 45. That is where hikers, often Boy Scout troops, were dropped off to begin the trek. Ken operated Trail Headquarters and his nonprofit organization, Outdoor Educational Activities Inc., from his home on Bear Wallow Hill for 64 years until he passed away in 2013. About one mile of the Yellowwood Trail that crosses Trevlac Bluffs Nature Preserve is now being maintained by Sycamore. Portions of the trail have been rerouted to minimize erosion and to provide access from Old SR 45. Be sure to stay on the trail, especially where it crosses private property. Please respect our neighbors. 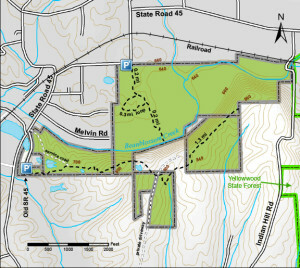 The second access point for Trevlac Bluffs Nature Preserve is a short loop trail through the bottomland, accessed from a pull-off at the sharp curve of SR 45. Gaze up at the remarkably steep bluff from this vantage point along Beanblossom Creek. Originally published July 2015. Adapted for The Twig February 2016.